When processing a piece of sensory information, the majority of us use just one of the five senses at a time. People with synesthesia apparently experience the world differently. According to self-described synesthetes (who include Vladimir Nabokov and Kanye West), the condition blends senses together, allowing them do things like see music, taste paintings, or color-code numbers. It's hard to imagine what that experience would be like, but there's now a mask that allows people without synesthesia to smell color. Zachary Howard, an aerospace engineer and art fellow at the software company Autodesk, built the device so he could experience the phenomenon firsthand. According to Popular Science, the synesthesia mask is worn in tandem with a finger sensor that can detect the color of whatever it's placed over. Different colors are programmed to trigger the release of different scents: Howard chose grapefruit for red, tea tree for green, and lavender for blue. 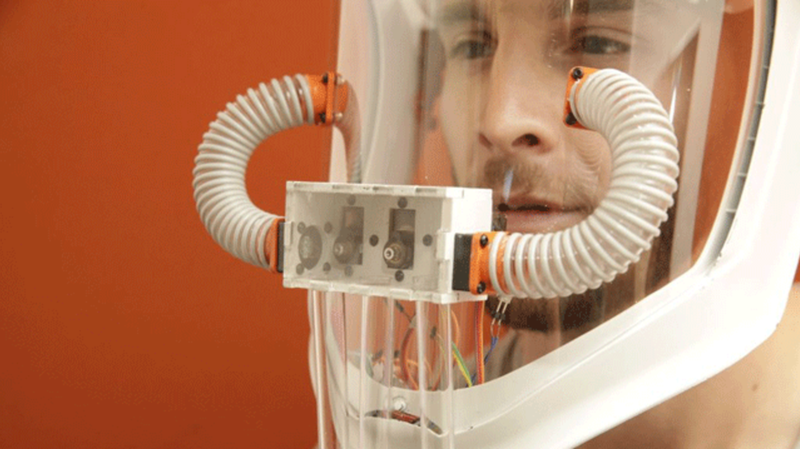 Touching any color in between releases a specific mixture of smells regulated by fans and motors in the mask. Howard's version of the mask offers a limited experience of how one might smell color, but the design leaves room for customization. The step-by-step instructions to build your own are available on Instructables.com. Watch Howard test out his own mask in the video below.